GBP keeps downward trend against USD for a month. In early November, the pair strengthened significantly and reached the level of 1.3170, but, failing to consolidate, went down. At the beginning of the week, the instrument reached a key support level, which is the local minimum of mid-August. Earlier, the pair fell to this level in mid-2017. The main catalyst for the fall was a significant strengthening of the dollar due to an increase in demand. At the same time, weak statistics on major indices were published in the UK, which reinforces the downward impulse. Today, negative data on the PMI Services index appeared. By the end of the week, one should focus on data from the USA on the labor market, production orders, and Nonfarm Payrolls. The downward momentum will be preserved, but first, the pair needs to overcome a key support level of 1.2660, which may be supported by strong data on the US labor market. Before further downward movement, the instrument should first move up, followed by lateral consolidation, and only then will it test new lows. Technically, the pair is in a well-defined downtrend. In this situation, it is important to "short" the trend from the upper borders of the channel. Technical indicators continue to show a decline signal: MACD indicates the preservation of the high volume of short positions, and Bollinger Bands are pointing down. Support levels: 1.2720, 1.2660, 1.2620, 1.2550, 1.2500, 1.2430. 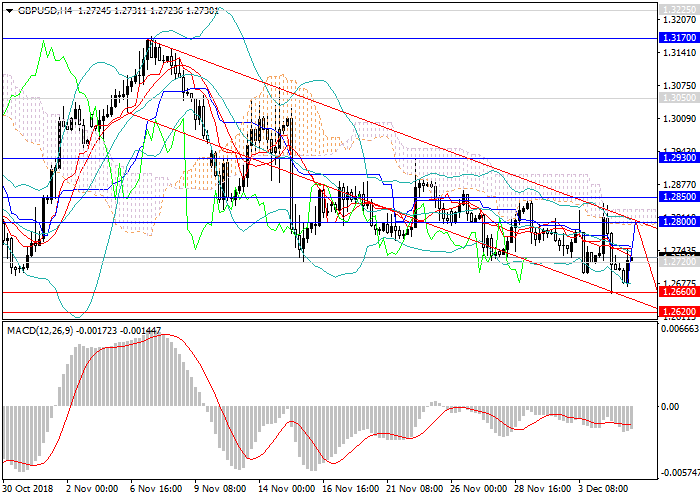 Resistance levels: 1.2800, 1.2850, 1.2930, 1.3050, 1.3170. Short positions may be opened from the current level and from key resistance levels of 1.2800, 1.2850 with targets at 1.2620, 1.2550 and stop loss at 1.2890.